If you are real wasabi, please raise your hand. If you’ve been putting dollops of spicy, nasal passage–clearing green paste on your sushi and gushing over your love of wasabi, we have some bad news for you. You probably haven’t actually been eating wasabi after all. The Washington Post’s Wonkblog did an investigation into what we’re all actually eating with our fish and why most restaurants skimp on the real stuff. The answer to the latter question is all about supply and demand. Real wasabi is very difficult to harvest and possibly even harder to grow. 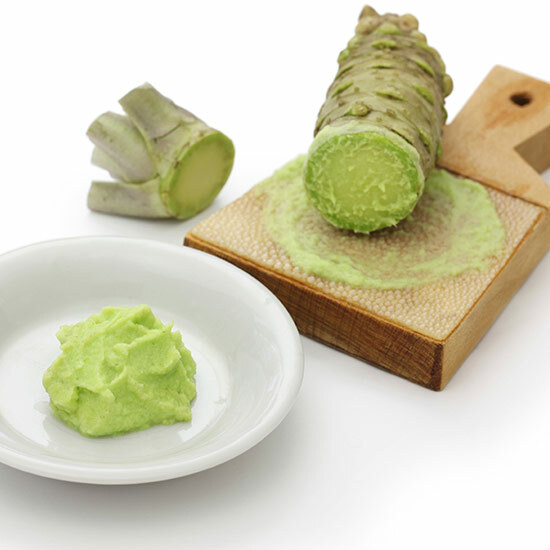 In an interview with wasabi.org, farmer Michel van Mellaerts said the ideal conditions for growing wasabi can have a fluctuation of only three degrees Celsius—between 12 and 15 degrees (that’s between 53 and 59 degrees Fahrenheit). Wasabi is also exclusively hand-harvested, so if you consider the massive number of sushi restaurants and packaged grocery boxes, it seems impossible that farmers could ever keep up with our need for the hot green stuff. What, then, are we actually eating? Trevor Corson, author of The Story of Sushi: An Unlikely Saga of Raw Fish and Rice, revealed that the green stuff on most our plates is “just plain old horseradish with some mix of mustard extract, citric acid, yellow dye no. 5, and blue dye no. 1.” More surprising, it actually comes to the restaurants as huge bags of powder that chefs mix with water to make a paste. The amount of real wasabi sushi chefs serve could be as low as 5 percent. Unfortunately, that probably won’t change any time soon due to price constraints (a typical ball of real wasabi costs $3 to $5), but now you know you can whip it up yourself without the neon food dyes.